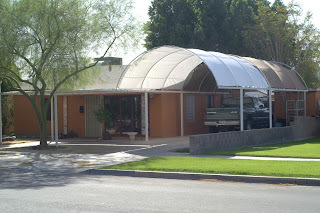 Last sunday while we were recovering from the previous nights party, Amy and I remembered about the Yuma Bargain Warehouse and decided to go see if we could find a new tarp for the carport. I had guestimated that it would be a 20′ x 20′ tarp…and after measuring the tattered rempains of the original that was looking about right. At the warehouse we found a good selection of tarps, of course the one we liked best (green mesh) they were out of in 20′ x 20′. But they had black mesh, heavy duty white and silver in that size. The black mesh was tempting…but being a mesh we weren’t sure if it would give as much shade as we wanted – and it was over double the cost of a silver or white tarp. The silver we didn’t like the looks of so at $37 the white tarp won out. We also picked up 2 – $2 bundles of nylon rope and headed home. Last night we finally put the tarp up, took a little over 30 minutes. From the front it looks ok (though replacing the other original tarp to match will make it look better.) and again the difference between this tarp and the original style is fairly obvious if you look where the sun is shining on them. 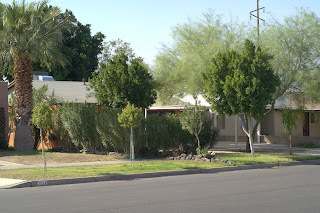 I included this shot just because I haven’t posted any of our house from this angle before. See why? We’re kind of hidden from the south and you can’t appreciate the front yard behind all those oleanders. And another shot showing that basically, yeah…it’s a $37 tarp and not a permanant replacement. Now that we know for sure 20′ x 20′ is the right size, and that it’s not that hard to put up the search for a permanant replacement is on. This does give shade…and the shadows on the ground are about equal it seems…but under this section it’s MUCH brighter since the whole thing kind of lights up instead of being a heavy opaque cover like the old canvas cover. To be honest I think I could get used to it…it seems like enough shade to stay comfortable in the summer. But at the same time the extra light makes it much more nicer under there if you’re trying to do something. If I stayed with white though I’d want to get a heavier less translucent white like we have in front of the front porch. 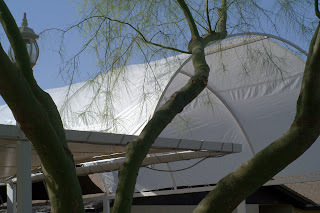 But the 75% shade mesh tarps are kind of intriguing…if only they weren’t so much more expensive. 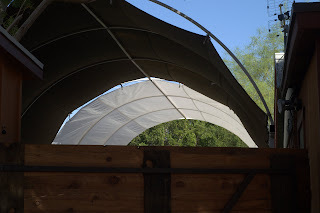 At lest this gives us shade and didn’t cost too much so we have plenty of time to shop around and find the perfect replacement for the entire carport. This entry was posted on Friday, March 14th, 2008 at 4:47 pm	and is filed under diy, house, new house, projects, wind. You can follow any comments to this entry through the RSS 2.0 feed. You can leave a comment, or trackback from your own site.